One of the best inexpensive ways to do a 2” lift on an original configuration Eagle is by using a 1” spacer there are some made of metal and if you can find one made of polyurethane. Or better yet a longer coil spring. By using a 1” spacer either on the top or bottom of the coil spring, the end result will be pretty close to 2” lift a bit higher or lower, there will be a difference from car to car. If you use polyurethane there will be some compression to the spacer. Lift the front of the vehicle making sure to use jack stands. Remove the tire and wheel giving you access to the suspension control arms. Remove the shock absorber fallow by the strut rod and drive train half shaft. Take this time to inspect and repair the half shaft. Next step is to remove the steering knuckle. Change the bearing in the axel hub All so get some new lower and upper ball joints. Now go ahead and remove the lower control arm. Here is where the hard part start you’ll need to use a coil spring compressor, be very careful for if they slip they can jump off whit such a force that they can kill your or any one they hit. If at all possible use the AMC specialty toll J-23474 front spring compressor. The last thing left to remove is the spring seat and the upper control arm. Take advantage of having every thing off and start cleaning all the parts and carefully inspecting parts for bents or cracks, fix and change as require, repaint them and most important change all the bushings bearings, ball joints and hardware it is cheaper to do it now than to wait till they need to be replace. Ok you got every thing strip off and clean, go out and purchase all your parts and get them together and ready for installation. If you are going to use a coil spring spacer take the coil spring along when shopping for the spacer to make sure the parts mate right. If you are going to go whit the longer coil spring witch I think is the better way to go, you’ll need to take in to account the compression ratio of the spring to figure out how long it will have to be to get the desire lift, any good spring shop will be able to help you out here. Once you’re ready to start rebuilding the upper control arm and the spring seat go in first fallow by the spring it self here is where it is tricky if you are using a spring spacer the parts need to be align in the correct position to avoid future problems. Once you’ve install the coil spring it is just a mater of putting all the parts back together and having the suspension align. Now you can go and do the other side. For a 2”lift there is no need to lower the differential it would be better but not require. As you can see the angle for the hald drive shaft is steep. 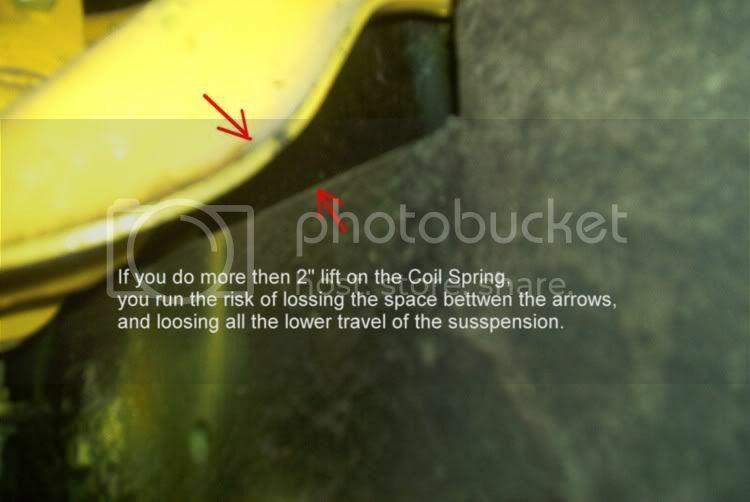 The reason you can only get about 2inch lift from a longer spring coil or spring coil spacer is that the top suspenssion arm hits in the frame, and you must leave some travel for the arm or you will have no lower travel. Video: Bad seal install on a front hub at a Jeep dealership. Spring Plate / U-bolt Plate Help..